When we moved from Chicago to Tucson 18 months ago, packing was a nightmare. We hadn’t had a good decluttering session in nearly 3.5 years, since our last move, which was local. We spent weeks, yes, literally weeks, giving away and selling junk that we just didn’t use anymore before we could even start packing our possessions. When we moved to Tucson, I vowed to keep on top of the clutter and the household messes. However, when we prepared to go on vacation recently and knew that our tidy neighbors would be coming in and out of our house for two weeks to cat sit, we realized we had a problem. The clutter, and the messes, had returned since the move. I spent several weeks decluttering again. Several bags of items went to the local kids’ resale shop; several boxes went in the garage earmarked for a garage sale later this year, and a lot of crap just got tossed in the garbage. I also made another $150 selling items on eBay. We haven’t had our garage sale yet, but based on what we have to sell, I think we’ll easily make at least another $100. Sure, these amounts aren’t going to even buy us a month’s worth of groceries, but we now have several hundred more dollars than we had a few short weeks ago, AND our house is much tidier. Original IMG credit: Dafne Cholet on Flickr. There were several items like my son’s arm shield for archery, our headphones for the computer, to name a few, that we were planning to replace because we couldn’t find them. Surprise, surprise, once we decluttered and cleaned up, we found these and many more things. We saved ourselves from buying duplicates. These small savings add up! Kids grow. . .A LOT! Pants that fit last winter may be two inches too short this winter. Games that they loved to play with last summer may be too babyish this summer. Why keep all these relics of previous phases of childhood? Clear them out so you have more room. My youngest two children and I had a particularly painful decluttering session when we tackled all the papers, toys, and little pieces that were littering the floor in front of their toy area. But how much better we all felt when we could see clean, empty floor in front of the toy shelves. In fact, my children started playing immediately in that space and had a great time. I notice now that the master bedroom is cleaner, I feel lighter and happier when I walk into the suddenly much more open space. We hope to stay in our home for many years, but the reality is that my husband may not have a job here in another year or two. Until he secures a permanent position, we feel like our home is ours temporarily, so it’s important to keep up a maintenance and cleaning routine in case we have to put it on the market some time. Having a clutter free home makes this much easier. What benefits do you get from a less cluttered home? 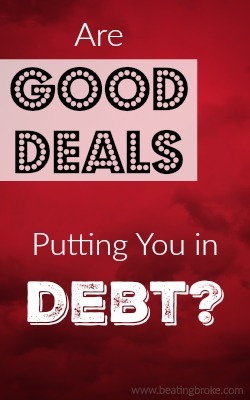 Are Good Deals Putting You in Debt? We all love a good deal, right? There’s nothing better than paying $2.40 for a pair of kids’ shorts that retail for $16 or paying $0.25 for Christmas wrapping paper at an after Christmas sale when it would cost you $2 or more to buy it new. After all, buying things on clearance is what savvy shoppers do, right? This is an excellent strategy for being frugal with your money, right? Well, yes. . .and no. Are those good deals putting you in debt? Ask yourself these questions and decide if you really need that good deal. Do You Buy More Than You Need? When something is on clearance 80% off, it’s tempting to buy alot. . .more than you need. After all, why buy one sweater at $5.00 on clearance when you could buy 8 for the cost of what just one would cost retail? Besides, you’re not paying any more than it would cost to buy a $40 sweater brand new, and you’re getting 8. What a deal! But do you NEED 8 sweaters? Will some of them languish in the back of your closet, with the tags still on, until you decide to purge your closet and give them away or try to sell them at a garage sale? Sometimes, you need to pass up good deals. If you can’t afford the deal and put it on credit card, are you really saving money? By the time you figure in the interest you’ll pay, that clearance sweater may end up costing you nearly as much as it would cost retail, or, if you pay only the minimum payment on your cards, even more! Some people have gone in debt in pursuit of good deals. Kristine Rogers, who was featured in Money magazine, explains that she went in debt buying children’s clothes on clearance: “Gymboree held a clearance sale in which every item was priced at $7.99. ‘I grabbed clothes my daughter didn’t need. I bought four of the same coat in different colors.’ By the end of the day, Rogers’ compulsion had cost her $800.” Rogers developed a full blown shopping addiction in the pursuit of sales and ended up with $50,000 in credit card debt! Sure, she got good deals, but in the end, after interest, she likely paid much more than she would have if she’d bought the items at retail. Are You Tying Up Current Cash Flow? 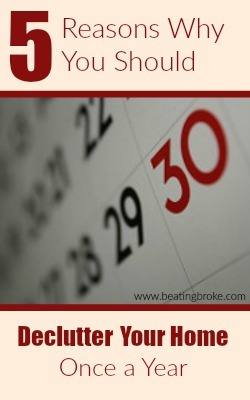 Assuming you don’t go into debt to buy good deals, you may still be tying up your cash flow. If you spend $40 on 8 sweaters that you buy in May but won’t wear until November, you’re tying up cash flow. If you don’t wear some of those sweaters at all, you’ve wasted money despite the good deal. What do you think? 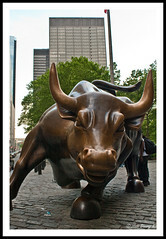 Is it worthwhile to pursue good deals, or can it be a slippery slope to overspending and debt? Do you buy items on clearance? Do you always use all of the items, or do you accidentally buy too much?